I have actually been very creative lately. I have several projects stewing in my head and I am plunking along very slowly on all of them. There’s the Owl Tree (still at about the same place it was when I posted my very last post). Well, I made some mushrooms to glue to the grass, but I didn’t take photos of them. 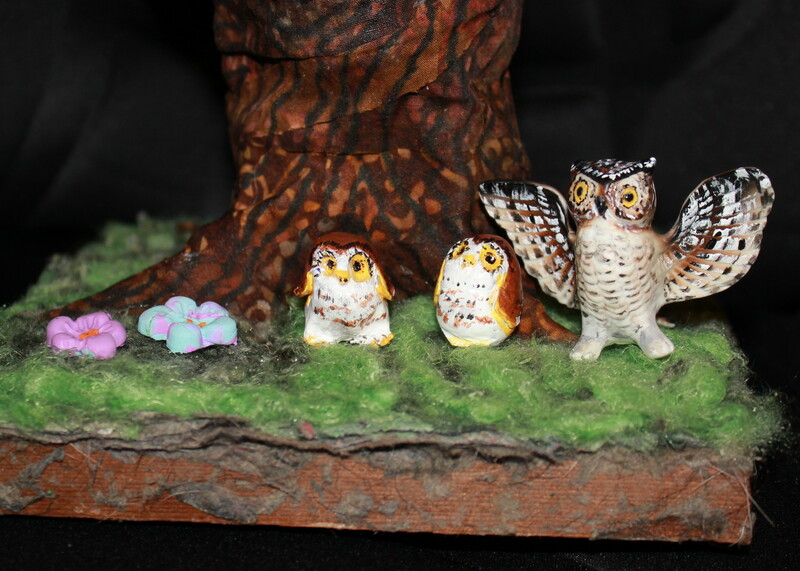 Well, I did paint the owlets. They came out pretty darn adorable. 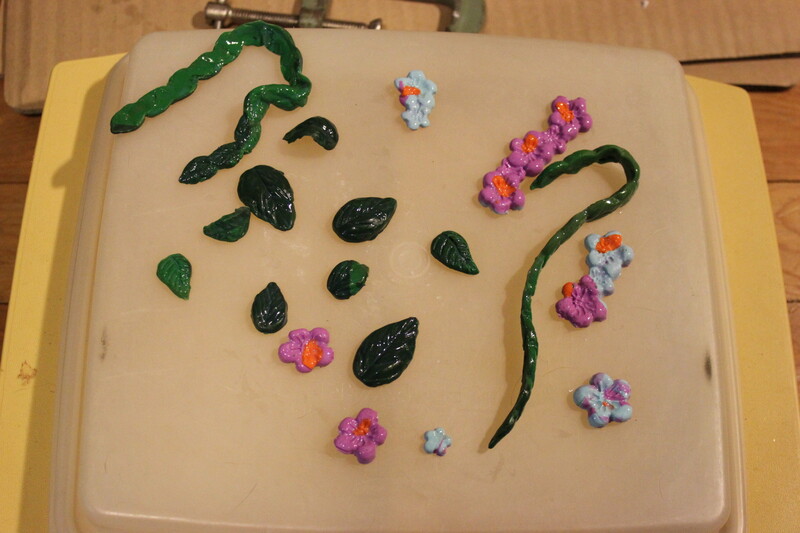 Tonight I am waiting for some of the other adornments to dry, so that project is stalled. I started a Faerie House a month ago. Okay, a month ago, I took a hammer to a decorative pitcher in the pretense of starting a Faerie House. I really did have a plan, but it has stalled several times. And I dropped the pitcher which shattered it even more, and I had to glue it back together. I did debate just trashing the project at that point, but it occurred to me that the glued-back-together pitcher would actually increase the “charm” value of the finished project. 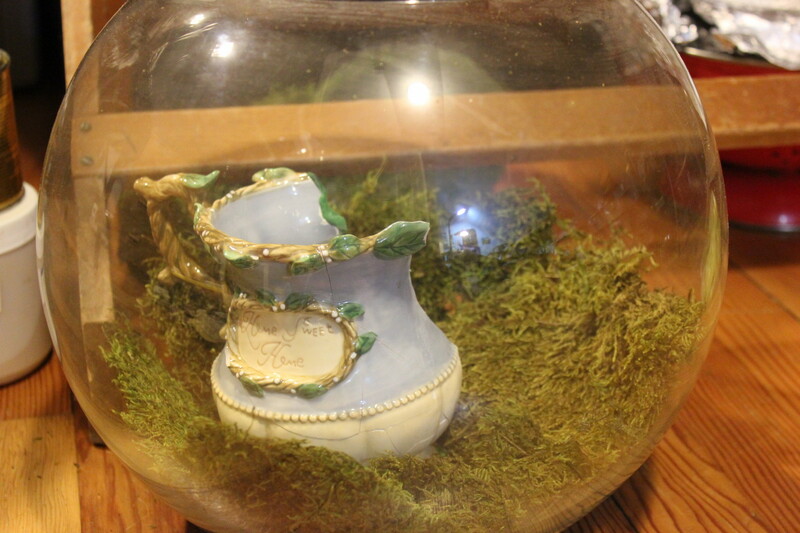 The idea is to build a “home” for some tiny woodland creature that can live within the confines of this terrarium. 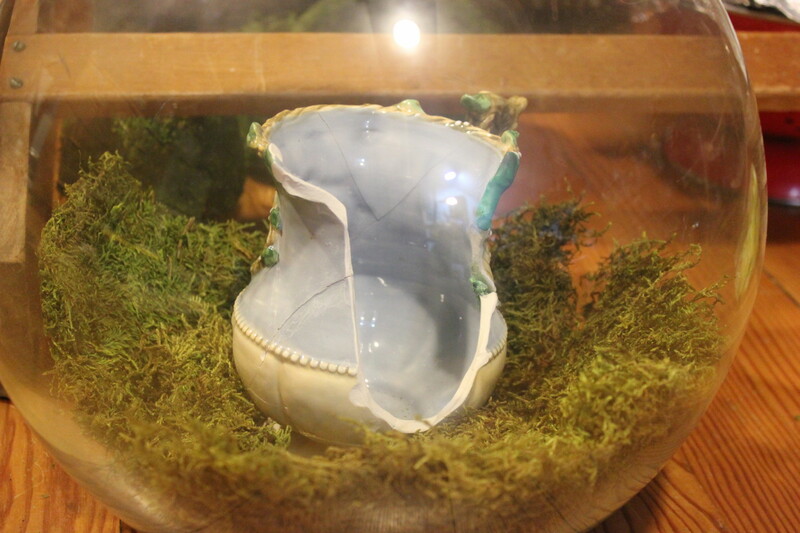 The terrarium comes with it’s own macramé hanger: I purchased two of these lovely items at a yard sale in 2010. I didn’t really want them, but some other object I wanted came *with* them and the seller wasn’t willing to sell that item separately, and the price was right. So the terrariums came home with me and I have been debating what to do with them ever since. Now I have a plan: hanging Faerie Homes. 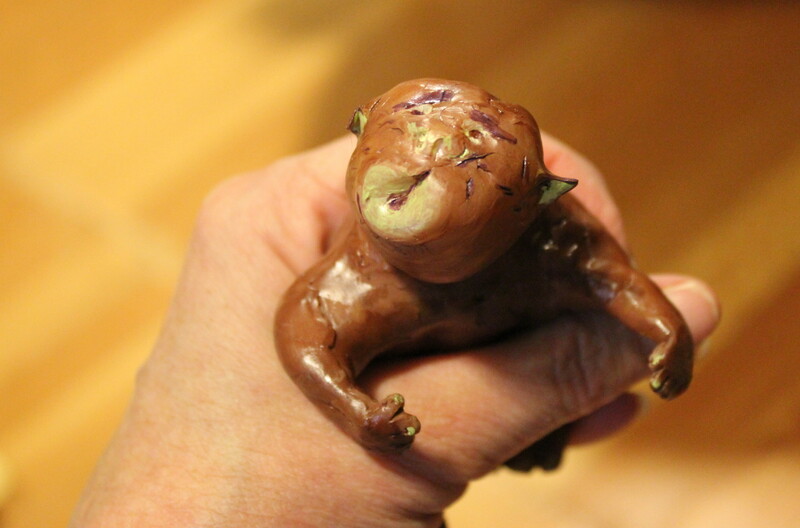 This project is stalled because I am waiting for some of the add-ons to dry. Those are add-ons for the Owl Tree and the Faerie House. They’ve been glazed and are drying. There may be more ivy created for the Faerie House. I haven’t decided on all the finishing touches. What is it?!! It is naked, I can assure you of that: we’re still in the debating process of what fabric to dress it in. It wants a Hawaiian style shirt, but I am not certain that is ogre/faerie appropriate. That’s tomorrow’s project: haul out swaths of fabric until we are both satisfied and then dress it. It looks slightly worried. 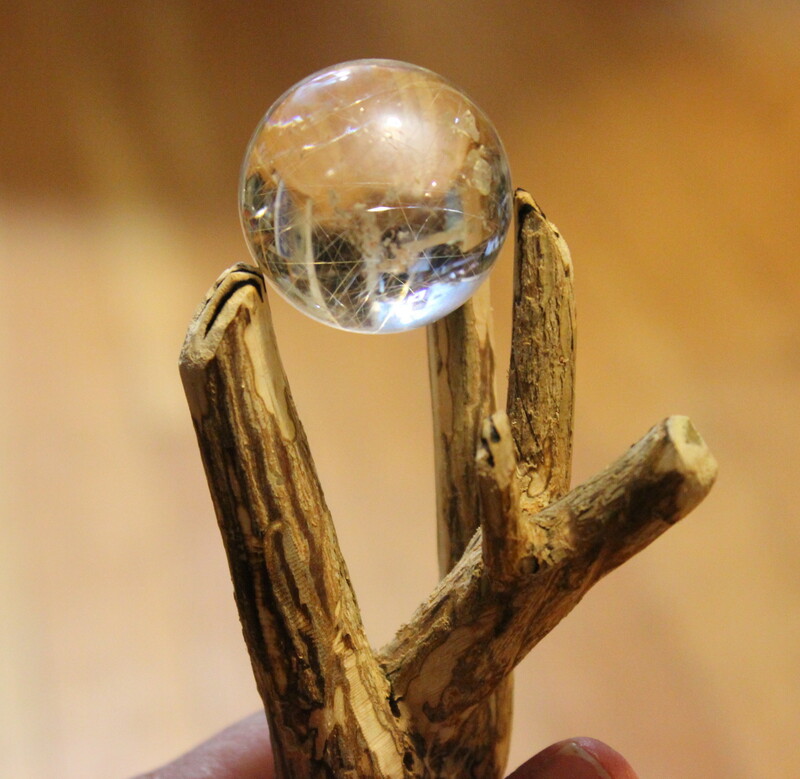 Then there is the magic wand project… My husband gave me a Dremel tool for Christmas. I played around with it right away, but it’s very noisy. I planned on experimenting more with it when said husband left to go hiking on the weekends. Then said husband had surgery and he’s been laid up in the recliner since the first of the year. I don’t want to play with the Dremel and disturb his rest and there’s no place outside of the loft for me to go with the tool. I am not going to go play with it in the cramped and cold garage – which was home to my husband’s Bonsai trees while we hovered in temps below freezing the first few weeks of January. You couldn’t even get in the door of the garage until it warmed up enough outside for me to move the trees back out. So the magic wand project went onto the back burner. Ah! But it warmed up nicely into the 50’s and the recovery has been good, so the stir-crazy husband took his dog and went hiking today. I had the house to myself. And I played with the Dremel. I sanded and shaped a branch, experimenting with speed and attachments. I think I will be OK with the Dremel tool: I can see the potential for all kinds of projects as I become more adept at handling it. I’m not finished, but this is definitely the direction I want to go with this wand. Yes, I think this is going to work out nicely. This really wasn’t the magic wand I wanted to work on, but I figured if I messed up, I would rater mess up on something I didn’t actually have plans for. 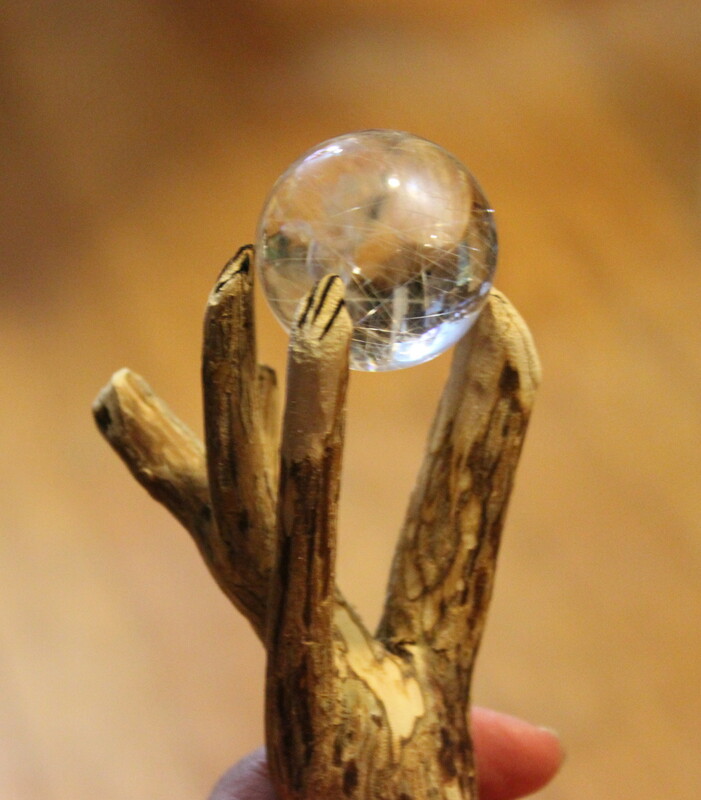 This particular item is disposable (not the glass ball, but the “claws”). It was just a confidence builder. I will probably be moving my craft posts to my other blog in the near future. I have hesitated to do that, but if I am actually going to dig in and create things, then it makes sense to move over there and reserve this blog for other rantings – er, writing. I love that you listen to the pieces you create and their voice is part of the process.